Bright red and redolent of earthy fall beetiness, this risotto makes great use of the beautiful beefy beets that are coming from the ground right now, and it’s warm, rich and filling; just the thing for cooler, darker nights. And it’s easy. Well, okay, not easy; like every risotto, it takes constant attendance and stirring. But the beet part is easy. 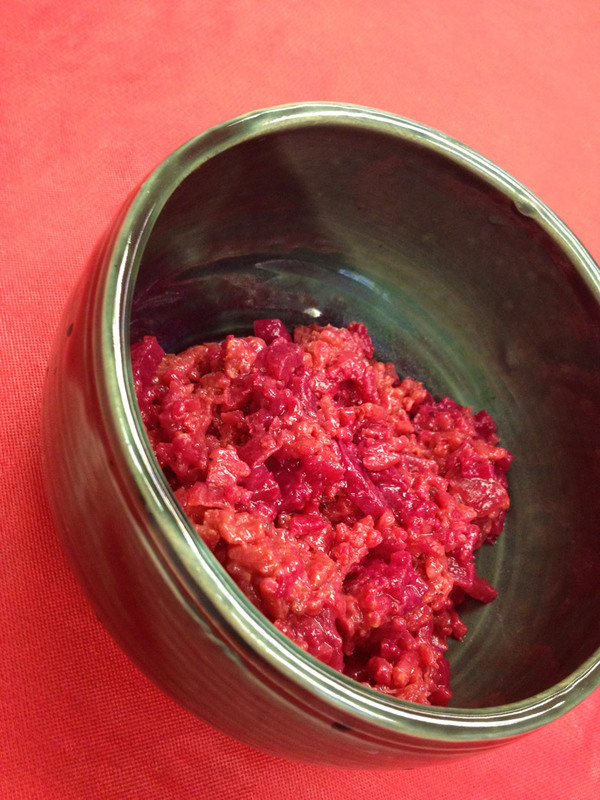 I had a recipe in a book for beet risotto that called for roasting the beets first, but I wanted it sooner. Surely, I reasoned, the beets would have plenty of time to cook in the 20 to 30 minutes of getting steamed in stock with the rice, as long as I cut ’em up small enough. Worked like a charm, and saved me an hour. The trick is to cut the raw, peeled beets no more than a quarter inch or so on each side. You could make quarter-inch cubes, or little wands, about an inch long, like I did. Then use your favorite risotto recipe. I heat a litre or so of chicken stock while sauteing a medium onion, coarsely chopped, and a clove or two of minced garlic in a few tablespoons of good oil. Before they go too far, throw in a cup of dry rice. Arborio or Carnaroli rice. Stir it around for a few minutes, until it starts to get a little translucent. Add a sploosh of wine. Maybe a quarter cup. Red’s great for this risotto, but white’ll do just fine if that’s what you’ve got. Throw in your beet wands now. Salt and pepper. Stir until the wine is mostly absorbed. Add a ladleful of stock and stir til that’s absorbed. Repeat until the stock is gone or until your rice is done to your liking. That’s it. Your beets will be perfect by then. If you, like me, find your risottos take longer than you expect and use more stock than the recipes you’re using, try cranking up the heat a bit next time. Works. Turn off the heat and stir in a few tablespoons of butter. You can serve it with parmesan, but that might be gilding the lily. Words: Rob Bitschofsky. Pictures: Kyla.